Let the Tech Crew assess your device, determine the issue and then recommend a course of action. We will clean all viruses, malware, spyware, adware and rootkits infecting one computer. We will make sure your anti-virus software and Operating System software are both up to date and verify functionality after cleaning is done. We will install or upgrade one Operating System on your computer, make sure it is compatible with your system, install necessary drivers, install available updates, and verify functionality. If applicable, you may need to provide Operating System license key and disks. We will restore your system to factory condition and install available system updates. 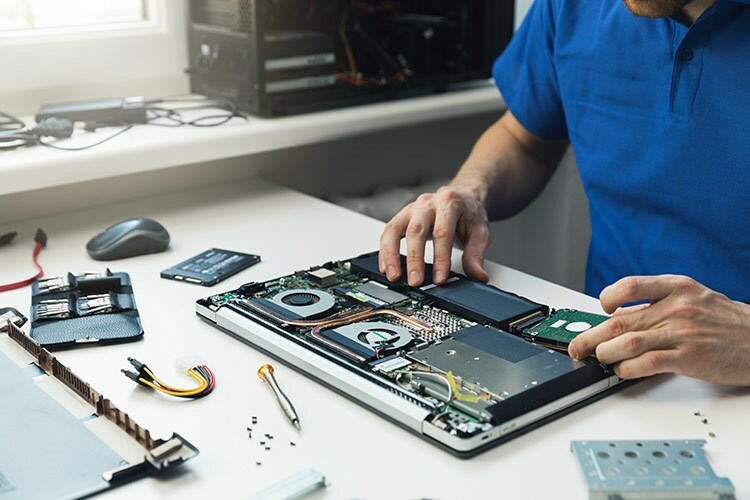 Let the Tech Crew setup your new PC by starting it up, creating a username and password (if requested) for your operating system, installing available system updates, installing one software title or peripheral, setting up email and creating setup recovery DVDs. Software or peripheral not provided. DVDs for recovery disks are included. A free assessment of your flash drive or hard drive will be done to determine if the drive is physically damaged. If the drive is in working order, upon your approval, we will attempt to recover any and all data. If we can recover your data, then it is a $50.00 fee to recover a flash drive and $150.00 fee to recover a hard drive. Storage media for recovered data is not included. A backup of your data onto a flash drive or external hard drive that you provide. DVDs can be used as well, if the data amount is under 8GB. We can also transfer all your data from your old device to your new one. Removal of one windows user account password on a PC you own. Installation of one piece of hardware or peripheral (ex: printer, scanner, web camera). We will make sure it is compatible with your system, configure it for your system and verify that it works. Hardware or Peripheral not included. We will create one set of DVDs that are a backup of your Operating System and associated drivers. This will allow for a system restore to factory condition in case of a computer crash. DVDs for recovery disks included. Your computer must be able to make a recovery DVD set for us to perform this service. Installation of one software title. We will make sure it is compatible with your system, install any updates available, create a desktop shortcut, and verify that it works. Software not included. Operating System installs are not included. We will start-up your tablet and connect it to the internet, set up one email account and download and configure one free app (Facebook, Twitter, Pandora, iHeart Radio, etc). For any issues or services that do not fall under these categories, we charge $75.00 per hour in shop. Any service offered can be performed on site at an hourly rate of $85.00 per hour.